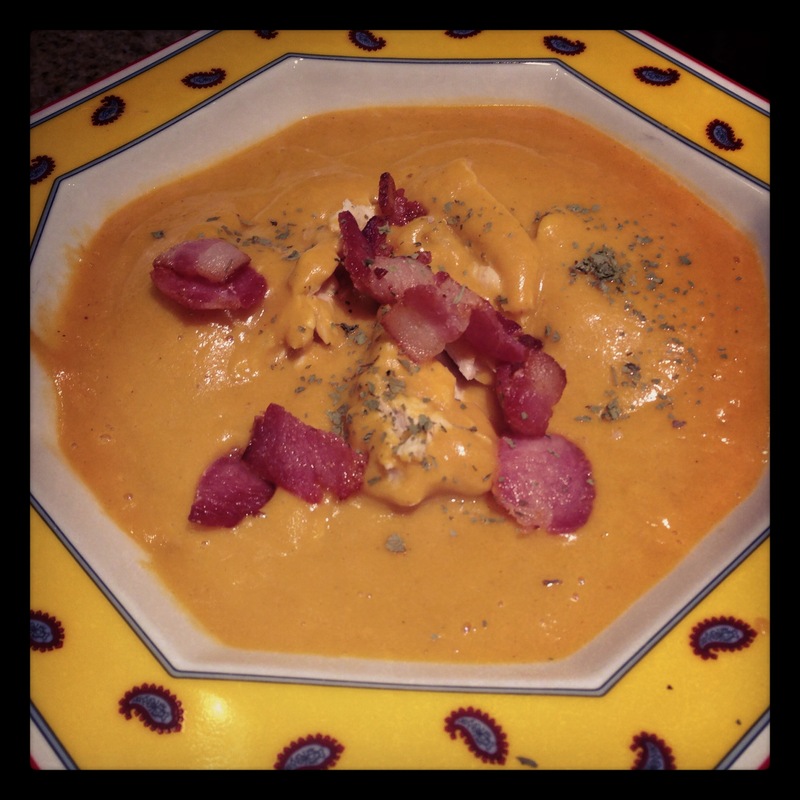 Spicy sweet potato soup with bacon and mahi mahi! Posted on January 19, 2013	by J.D. I made the following recipe from this most excellent paleo site. While technically we try to avoid sweet potatoes, it is a nice treat .. occasionally I cut the recipe in half as it was just me, and super awesome. I also added mahi, and highly recommend it. 1. Cut bacon into 1/4-inch slices and place in a cold soup pot. Heat the pot over medium-high heat and cook the bacon until it’s crisp. Remove with a slotted spoon to a plate covered with paper towels and set aside to drain and crisp. 2. Keep 1 tablespoon of the fat in the pan and discard the rest. Re-heat the fat over medium-high heat, then add the onions, Ras el Hanout, salt, pepper, and cayenne. Cook, stirring occasionally, until the onions are soft, about 5-7 minutes. Toss in the garlic and stir, cooking until fragrant, about 30 seconds. 3. Add the sweet potatoes, broth, and water to the pot. Bring to a boil, reduce heat to simmer, cover, and cook until the potatoes are tender, about 10-15 minutes. 4. Pour carefully into your awesome kitchen tool (I used a blender! ), purée the soup until it’s smooth. I then served and put remainder in storage bowl as I’m not a fan of washing extra dishes. Add a little bacon (I used cilantro as that is all I had to use). At the same time I placed a 6 ounce piece of mahi mahi into tin foil with coconut oil and some seasonings for 25 minutes while the soup is cooking. I placed fish in bowl; poured in soup, and topped. Passionate about CrossFit, mindset, bettering each other, technology, and the intersection of cybersecurity with products. The online views and posts represent my journey of discovery and learning. This entry was posted in Food!, Uncategorized and tagged bacon, breakfast, dinner, mahi, paleo, soup, sweet potato. Bookmark the permalink.